It’s out of the Bag... I’ve been working on it for months. 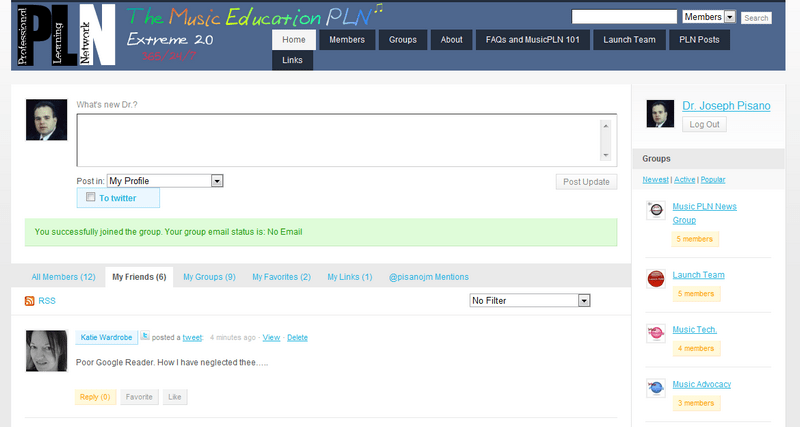 The Music Education Professional Learning Network (PLN) is officially in ALPHA state. I’m hoping that this will be the next big thing in bringing together Music Educators and all types of musicians into our ongoing conversation about Education, Music, and Technology. So, from this point-in-time on, you will be seeing things about this PLN popping up here and there in your other “networks”. There will be many more posts coming your way shortly, including an announcement of our MUSIC PLN LAUNCH TEAM members in just a few days. In addition, I will be announcing a couple of dozen slots available in two-to-three-weeks for BETA testers. If you are interested in being a BETA Tester, please contact me directly via the contact-page on MusTech.Net. More information about that will be forthcoming here on MusTech.Net. As you know, for over five years I’ve actively been trying to get better information on the Internet about Music, Education, and Technology either through things like MusTech.Net, The 100 ME Blogger Project, The Music Education Blog Carnival, Project MUSE, Project PO-EM, MusicEdNews.Com, my work with #MusEdChat, the TWITTER MUSIC educator’s List, the Monday Morning Music Mix, and many other initiatives. This PLN is going to be a continuation of that outreach. While there are a number of ad-hoc things going on that “many of us are involved in” or “slightly involved in” or “some of us involved in one or another”… there has been little attempt to provide a large enough platform that would integrate many of these things together in a way that still allows all of the others to exist, be independent, and yet provide a home-base of activity for Music Educators actively using the WEB 2.0 platform and applications. This is my ultimate goal for this PLN, not the “taking” over of other great start-ups and ideas, but rather a platform for bringing them all together and building them all through better awareness and concentrated discussions. I believe this goal will be accomplished, or at least -partly accomplished, through this new Website. 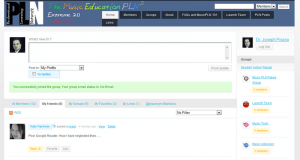 If you are looking to get a better “peek” at the PLN, you can see the landing page at http://musicpln.org or http://musicpln.com. Get ready, it’s moving now!